Genetic Counselor: James Speer, M.S. Acupuncturist: Amy Matton, MTCM, L.Ac. Acupuncturist: Melissa Morone Sommer MS, LAc, Dipl. Ac. Acupuncturist and Certified Herbalist: Elaine M. Malin, MTCM, L.Ac. 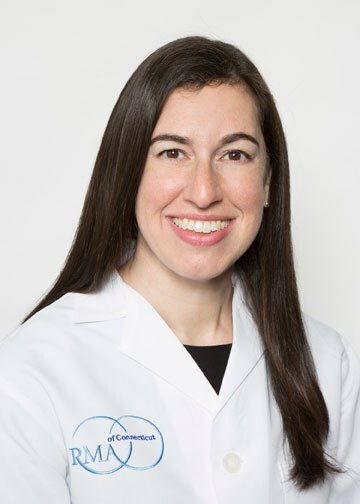 Reproductive endocrinologist, Ilana Ressler, M.D., knows that when patients ask questions and receive thoughtful answers, it goes a long way to support and help those experiencing infertility. This is the philosophy she brings to RMACT as she joins us as a fertility specialist, board-certified in both Obstetrics and Gynecology and in Reproductive Endocrinology and Infertility. Drawing from both her years of practicing medicine, and her philanthropy efforts providing emotional support to those undergoing fertility treatments, she facilitates the fertility journey of her patients with a warm and genuine bedside manner. The relationship with her grandmother, who serves as a strong role model and influence in her life, gave rise to Dr. Ressler's understanding that confidence and high self-esteem is so necessary for women to thrive in today’s world. Knowledge is an important building block in this effort, especially for a segment of patients near and dear to Dr. Ressler’s heart – those affected by Polycystic Ovary Syndrome (PCOS). The most common endocrine disorder affecting women of reproductive age, and one of the leading causes of infertility in women, PCOS goes undiagnosed in 50% of women who have it. It is particularly rewarding to help those women with PCOS find a solution to something that has often been troubling them their entire lives. While Dr. Ressler has been actively practicing medicine in the area for several years, she began her education at Duke University, earning a BS in Psychology. She then received her medical degree at Case Western Reserve University and completed her residency at the University of Illinois at Chicago. During her residency, Dr. Ressler was awarded the Professional Dedication to Residency Award in 2009, and the Overall Excellence in Gynecologic Care Award in 2010. In 2013 she completed a fellowship in Reproductive Endocrinology and Infertility at the University of Cincinnati. In 2016 and 2017, Dr. Ressler was chosen by her peers at the American Society for Reproductive Medicine to receive the Fertility and Sterility Star Reviewer Award. She also regularly reviews the latest GYN surgical studies and writes literature reviews for the Society of Reproductive Surgeons. She is a member of the American Society for Reproductive Medicine (ASRM), the Society for Reproductive Endocrinology and Infertility (SREI) and is a Fellow of the American College of Obstetrics and Gynecology (ACOG). In 2018, Dr. Ressler was named to the editorial board of Fertility and Sterility, the American Society for Reproductive Medicine’s premier international journal for those who treat infertility and reproductive medicine. Dr. Ressler serves as Medical Advisor for Yesh Tikva, which was established to create a Jewish community of support for those experiencing infertility. She also launched the Pies for Prevention program in her Westchester community to benefit Sharsheret, the nonprofit organization supporting Jewish women and families facing breast and ovarian cancer. Dr. Ressler lives in Westchester, New York with her husband and three young children. She enjoys spending time with her immediate and extended family and cheering for her beloved Cleveland sports teams or Duke’s Blue Devils.